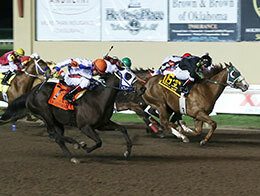 La Vencedora (#7) battles Eagles Jazz(#6) to victory in the $932,500 Remington Park Oklahoma Bred Futurity Saturday night at Remington Park. OKLAHOMA CITY, OK�APRIL 22, 2017�The top Oklahoma-bred 2-year-olds squared off in Saturday night�s $932,500 Remington Park Futurity(RG2) with La Vencedora prevailing in a thriller. She won by a head over Eagle Jazz as the pair ran next to each other to the finish line. Owned by Terry McLean of Claremore, Okla. and trained by John Weghorst, jockey James Flores had the winning ride on the filly, who was the fastest qualifier on the second day of trials April 8. "The filly ran a great race. When the gates opened, I knew we had a great break. I didn�t look to the sides or look back, I just looked forward and did my best. It was a close race with the 6 (Eagle Jazz). I asked for everything she could give me and she responded great. She�s been pretty natural and easy to work with, I liked her from the start." La Vencedora handled the 330 yards in 16.76 seconds over a fast track and was slightly ignored in the wagering at 9-1 odds, paying $20 to win, $9.20 to place and $4 to show. Eagle Jazz paid $4.40 to place and $2.80 to show. Hez Our Prize, the beaten betting favorite at 6-5 odds, was three-quarters of a length behind the winner in third and paid $2.40 to show. Bred in Oklahoma by Bobby Cox, La Vencedora�s Remington Park Futurity win is her second career victory from three starts and was worth $373,000. The daughter of IVORY JAMES from the Mr Jess Perry mare Jess Shakem has now earned $382,006. This was the first Remington Park Futurity win, a restricted Grade 2 event for eligible Oklahoma-breds, for all of the connections. Rounding out the order of finish in the Remington Park Futurity: The Only Knockout (4th), Political Attraction (5th), My Southern Dynasty (6th), Double Eagle (7th), Returning Motion (8th) and DF AJ Green Leaves (9th). EOS A Political Win was the top qualifier from the April 7 trials but was scratched by the Oklahoma Horse Racing Commission stewards.